Blog from Agra, India | Harper goes to France! The Taj Mahal!!! We went for sunrise, so amazing. It is immaculate. All white marble and it is completely symmetrical. We had an extremely knowledgeable guide, Emril, for the Agra leg of our India tour. He told us all about the love story surrounding the Taj, it was built by Emperor Shah Jehan as a tomb for his favorite wife (one of three) Mumtaz Mahal. 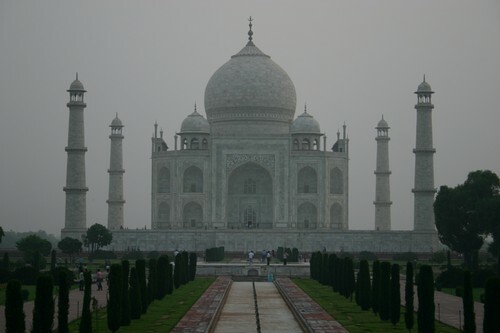 It took 22 years and 20,000 men to build and cost 41 million rupees and 500 kilos of gold! Everything is so detailed and beautiful from the floral patters to the carved marble screens. Words can't even describe the awe inspiring beauty, definitely one of the 7 wonders of the world. After Taj Mahal we were on to the Agra Fort. It is still used by the Indian military but we were allowed into some parts. Historically, it was surrounded by two moats, one filled with crocodiles and one filled with hungry lions. The emperor used to play chess on the marble court with actual women in his harem. He would yell down from his throne (move three spaces forward) and the women would do a special dance on their way to the new space. I assured Wes that there would be no live women chess games on our terrace when we get home. Our driver Brij Lal has been with us from Delhi, he stayed locally in Agra and drove us everywhere. He took us to an amazing Indian restaurant (I guess here it's just a restaurant), where he went all Indian mafia on the wait staff to ensure that we were sitting in the coolest (temperature cool) seat in the place. He was pointing and demanding until they sat us under the ac unit and had two fans pointing at us. Now that is service, especially when you've been sight seeing in 107 degree heat. He's a great guy, he'll be with us for the whole India trip, it's so reassuring knowing that he is always with us in case we need an interpreter or just a heavy.